Nice lines, tip-tank choice, fine panel lines and generally good detail levels for the scale. The horizontal split of the intakes may make for some difficulties. Resin wheels may have been a better option over styrene. A very nice kit of an attractive subject. Yes, the title should really read F-80C as the P for Pursuit designator had been replaced by F for Fighter by the time the C model of the Shooting Star was involved in the Korean War. 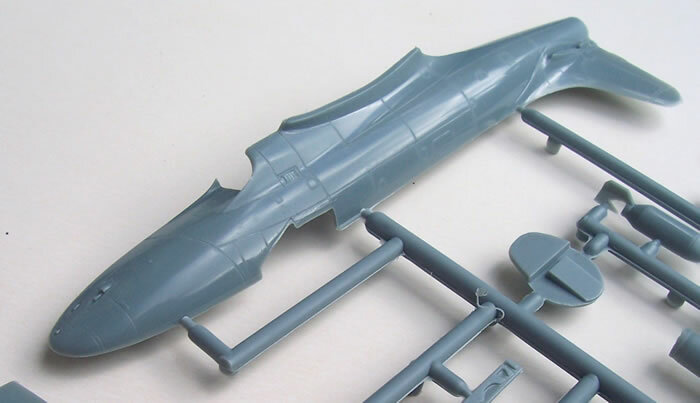 However, P-80C is the description used on Sword’s box-art, and so it is used here in the title to the kit’s review. By mid-WWII, the USA was in a position to design and manufacture jet aircraft thanks to the British sharing their jet engine expertise, by providing built-up engines and licensing various designs for US manufacture. The first US jet aircraft to fly was the Bell P-59, which proved to be a rather overweight and uninspiring design. Another and altogether better design was the Lockheed P-80. It was the product of a brilliant Lockheed “Skunk Works” design team led by “Kelly” Johnson. The first airframe was developed and delivered within a staggering 143 days. The prototype, known as Lulu-Belle first flew in January 1944. Following a crash a second prototype designated XP-80A was built. 12 pre-production YP-80A’s and one F-14 photo-reconnaissance version followed this. Four of the YP-80’s were transferred to Europe in January 1945. However a crash led to their grounding and no combat occurred before VE Day. The production P-80A looked much like Lulu-Belle but was in reality different in many areas having been designed for improved performance and mass production. Major external differences included rounded versus squared wing and fin tips with increased span and height respectively. Also the P-80A had wing-tip tanks, splitter plates and bleed vents in the intakes, and a landing light in the nose. Despite being bigger than Lulu Belle, performance was much better with a more powerful engine installed. They began to first enter service from July 1945. The P-80B was very similar to the A, but had water-alcohol injection system for the engine, an ejector seat with a slightly different shaped canopy, and a radio-compass in place of the nose landing light. In 1947 a P-80B modified as an XP-80R captured the world air speed record at 623.73 mph. But such were the times and pace of aircraft development that this record would be broken frequently over the years to come. The P-80C was the last major fighter variant. I went into production in 1948, and later that year following the formation of the USAF it became the F-80C. Compared to the P-80B it had a more powerful engine, a canopy extractor extension behind the canopy, and the pitot was moved from the tail-fin to under the nose. The F-80 and its photo-reconnaissance derivative, the RF-80, were to see combat during the Korean War. The F-80C was outclassed as a fighter following the introduction of the MiG-15 by the communists, and was increasingly used in the fighter-bomber role whilst the F-86 Sabres dealt with the MiGs. A good first generation jet, the F-80’s export success was relatively modest and confined to six South American nations. However it was also developed into the extremely successful and widely used 2-seat trainer as the T-33 Shooting Star. This design was further developed into a radar-equipped after-burning all-weather interceptor as the F-94 Starfire. Often overlooked is another highly modified development of the T-33 for US Navy use, known as the T2V –1/T-1A Seastar. This had a raised cockpit line, leading-edge slats, tail hook for carrier landings, and was the first US aircraft to have boundary layer control using engine bleed-air. But that’s another story. 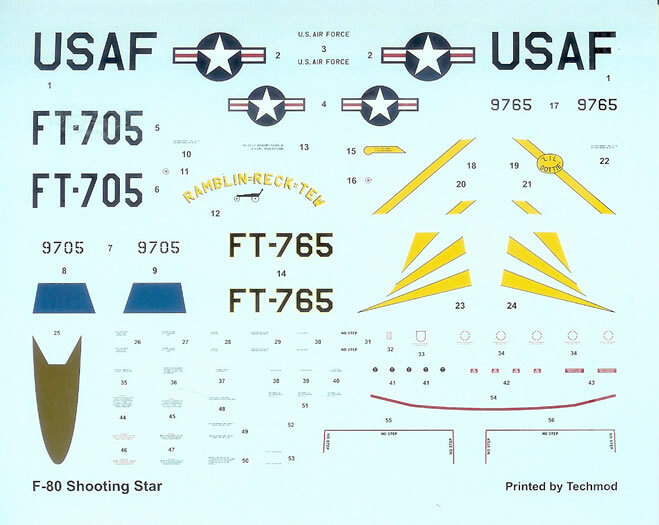 I am aware of three previous F-80 kits (I’ll drop the P-80 designation as I think all were F-80C’s). 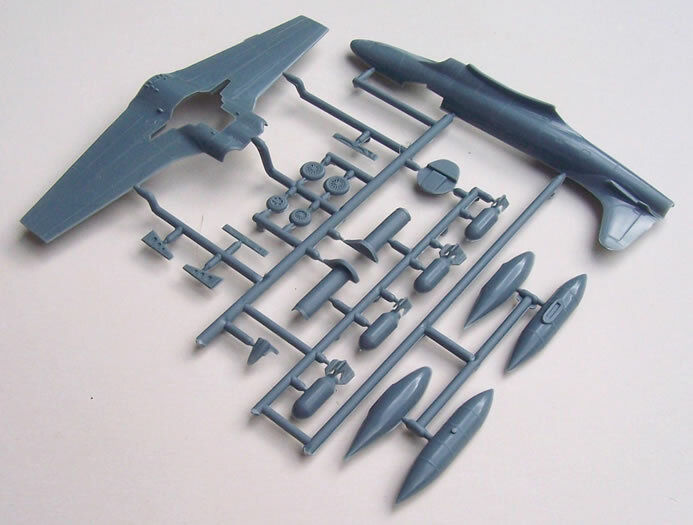 Airfix produced a very nice kit from the period when they were noted for good outline, acceptable levels of detail and fine raised panel lines. Perhaps a bit dated now, it can still be made into a nice model. Some years ago Gran released a kit which seemed similar to the Airfix offering, but from what I have read was a dog to build and had terrible decals; and so probably best avoided! RVHP also offered a resin kit about 13 years ago. It was basic without instructions or decals and had variable quality detail. 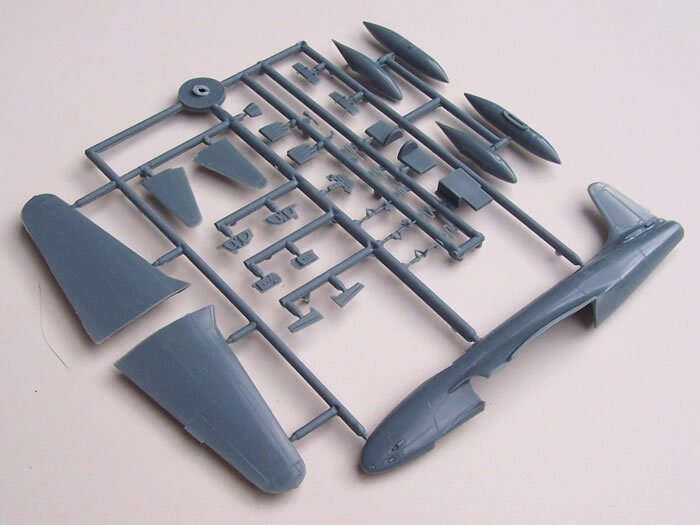 When compared to the Airfix kit its only edge seems to be that it offered engraved panel lines, but for a much higher price. Chances are only a few 2nd hand kits are available. The kit comes in a typically Czech end-opening box with attractive artwork on the front. 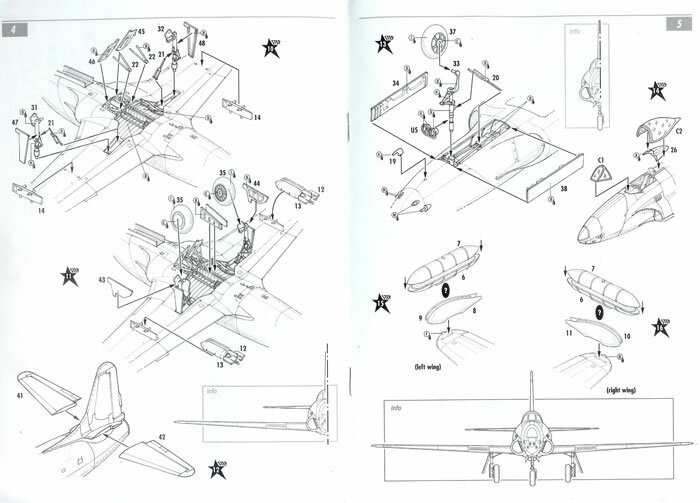 The instructions provide a parts map, and easy to follow diagrammatic assembly format. There is also a brief history of the aircraft. Text is in Czech and English. Painting and decal guides are quite adequate black & white shaded 4-view drawings. Generic colour call outs are provided for detail parts and airframe. I have numerous Sword kits, and this one is quite typical in that the plastic has a more shiny finish than many other Czech brands. All parts are quite cleanly moulded with very fine engraved surface detail. 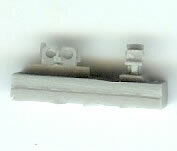 Sprue gates are narrow, and some small amounts of flash are present in places, but this can be easily removed. 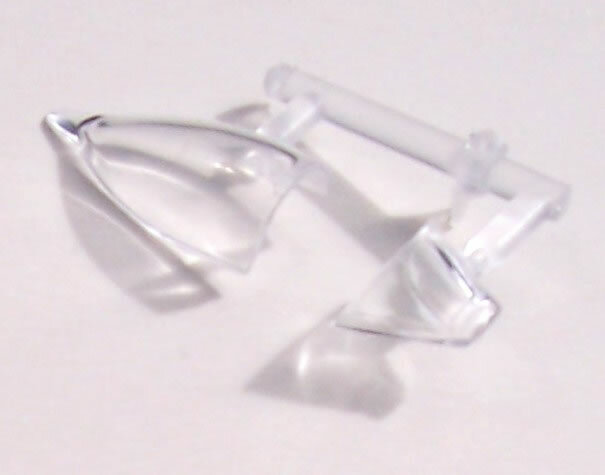 The resin parts are produced to high standards. 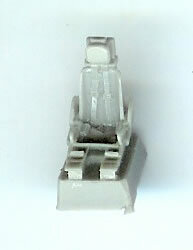 The cockpit is reasonably well catered for with a styrene tub, joystick and instrument panel plus coaming, along with a nicely detailed resin ejector seat and gun-sight. 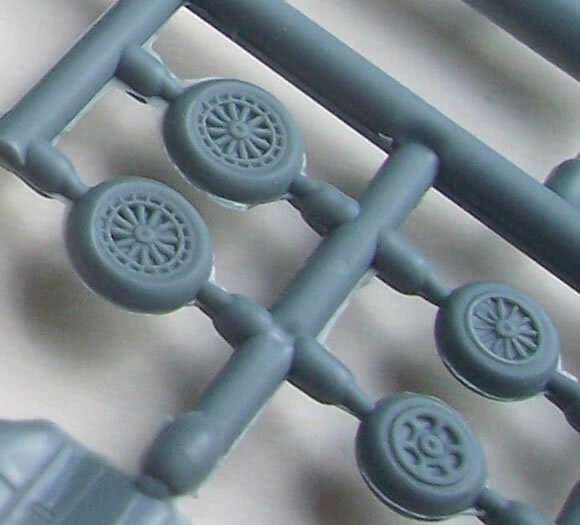 Some may wish to add some items to the tub sidewalls, as these are a bit plain. Resin inserts provide excellent detail for the nose and main wheel wells, the latter include the inside detail for the ventral air-brakes. 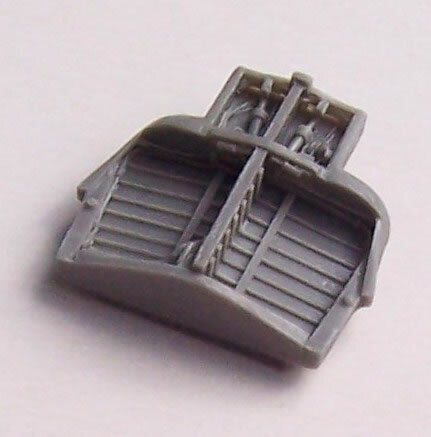 Resin also caters for the landing lights fitted to the front undercarriage leg. The clear canopy is injected, provided as two parts, and is quite thin in section. 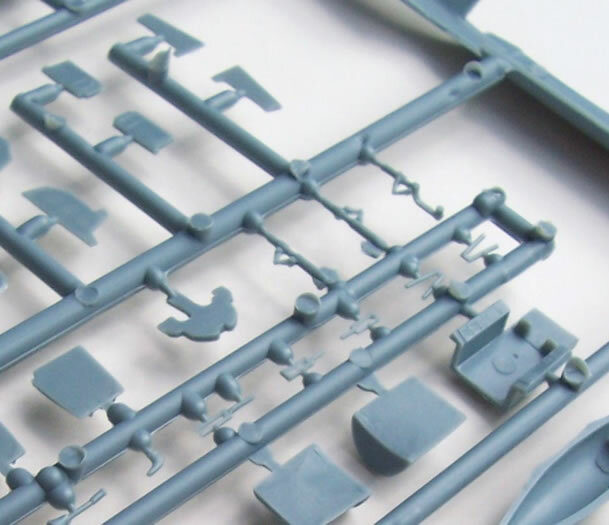 Most of the finer styrene parts are well moulded with acceptable detail, but the wheels fall just a little short of ideal. Their spoke pattern is not quite as crisp as it might be, revealing the limitations of Sword’s moulding technology. I think resin wheels could have been justified here. To be fair, they are not bad, but not perfect either. As an aside, there are two patterns of nose-wheel, so make sure you use the right one. Two 500 lb bombs and a choice of standard or Misawa tip-tanks is provided. The bomb pylons are nicely done with a suggestion of sway-brace lugs. 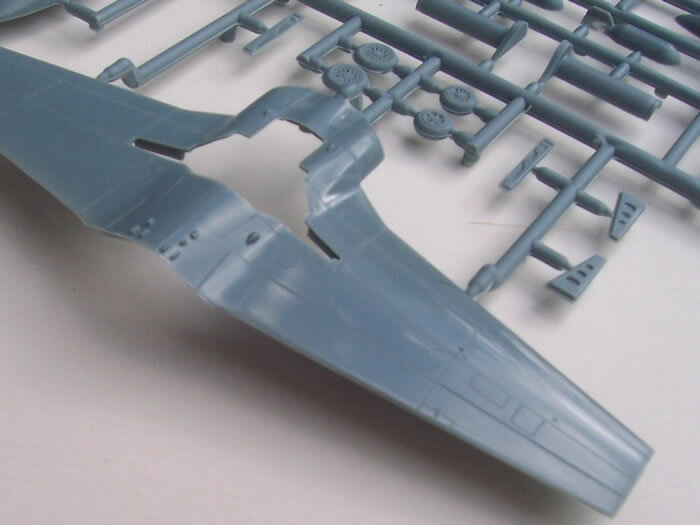 Construction sequence and parts breakdown is generally conventional for the type, but the horizontal split of the air intakes could make for possible fit and seam problems. However tooling the intakes as a one piece would have led to a circumferential seam that could be just as awkward, so it will all come down to how well the parts actually fit. Aside from this aspect it looks as if it should be a very straightforward build. The two decal options are quite attractive. The anti-glare panel is also provided as a decal, and this should help avoid having to mask varying radius curves. Some quite extensive stencilling is provided for, along with a separate decaling guide for this stage of finishing. 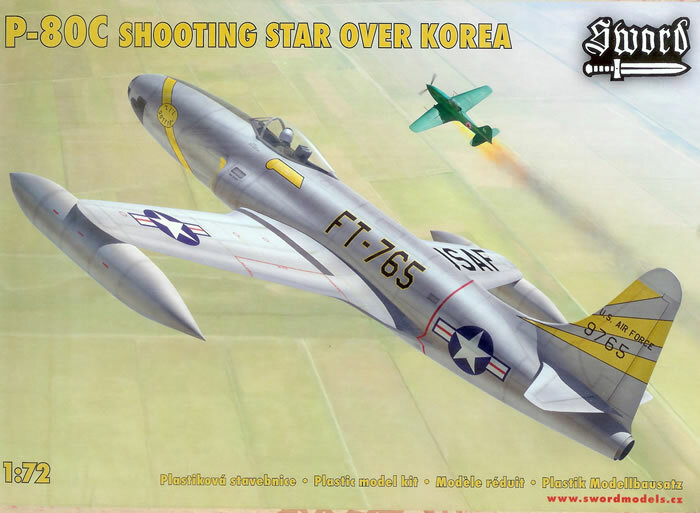 Both schemes are for USAF fighter-bombers serving in Korea during1950. Decals look to be well registered with good opacity. This is a really nicely engineered kit that is produced to generally high standards. 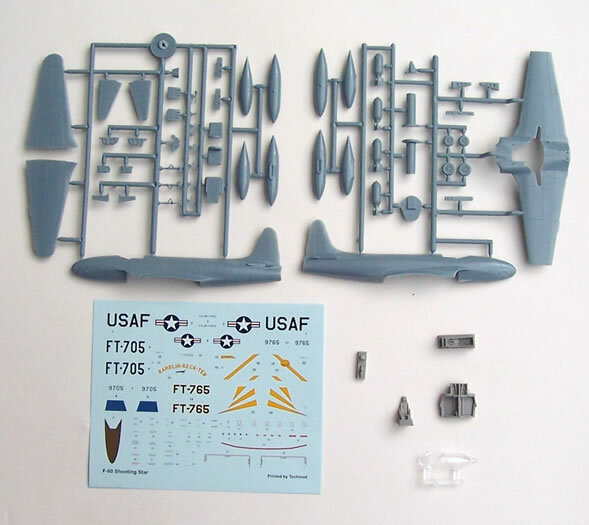 It has the potential to produce a very good model of the F-80C, and is a distinct advance over the most readily available alternative from Airfix. So well done Sword! You’ve given us modern kits of the P/F-80C, RF-80C and T-33, so how about a new F-96 Starfire and/or T2V-1/T-1A Seastar next?